If you are a smoker that would like to quit, mark November 16th on your calendar–the date of this year’s Great American Smokeout. The third Thursday in November each year has been designated as the national day to help people quit smoking. If a smoker quits smoking, even for one day, they are taking an important step for themselves and their future. This year’s event is also the 10th Great American Smokeout since Nevada implemented the Nevada Clean Indoor Air Act. The Nevada Clean Indoor Air Act (Nev. Rev. Stat. § 202.2483 et seq.) was passed by a majority of Nevada voters on November 7, 2006 and officially took effect on December 8, 2006. It substantially changed Nevada smoking laws to protect people from secondhand smoke in most public places and indoor places of employment. Although the Act has been in place for over a decade many people still have questions about what rules need to be followed. The Nevada Clean Indoor Air Act prohibits smoking tobacco in any form in most public places and in all indoor public and private places of employment including: buildings, healthcare facilities, childcare facilities, public and private schools and school property, University of Nevada and Nevada Community College campuses, retail stores and malls, grocery and convenience stores, movie theaters and video arcades, and indoor areas of restaurants and their kitchens, childcare, adult care, and healthcare businesses in private homes. However, home offices in private residences are exempt. Hotels and motels, retail tobacco stores, strip clubs and brothels, and casino gaming floors where minors are banned are also exempt from the Nevada Clean Indoor Air Act. In 2009, lawmakers passed Senate Bill 372, allowing smoking in areas of convention centers during tobacco-related trade shows, under certain conditions. Then in 2011, lawmakers passed Assembly Bill 571, permitting smoking in completely enclosed stand-alone bars, taverns, and saloons in which minors under 21 years of age are prohibited from entering. Nothing prohibits the owners of establishments not covered by the Act from declaring the facility entirely smoke-free. While e-cigarettes are not currently covered under the Nevada Clean Indoor Air Act, employers can choose to ban the use of electronic smoking devices in their workplaces. “No Smoking” signs or the international “No Smoking” symbol must be posted at every entrance to a facility covered under the Act. Since its enactment, the Nevada Clean Indoor Air Act has protected Nevadans and visitors to the state from exposure to secondhand smoke. It’s also worth noting that over one million Nevada employees are given the right to work in a smoke-free environment. We want to make sure you are compliance with the Nevada Clean Indoor Air Act. 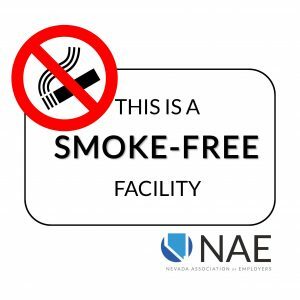 We now offer a high quality 6″ x 6″ NO SMOKING sticker (pictured left) for NAE member organizations subject to the Nevada Clean Indoor Air Act. NAE member organizations can request up to two (2) stickers, which we will provide for FREE — another benefit of NAE membership. Request your FREE stickers by contacting us at info@nevadaemployers.org. Stickers will be mailed to the address we have on file for your organization unless you indicate otherwise.